Barring some kind of setback, Carson Wentz is going to start Week 1 of the regular season. That's not a report. I don't have some kind of source inside the Philadelphia Eagles' organization telling me that. I'm merely a reporter, with eyes, who is watching Wentz in practice every day. In my view, it's not even a debate. 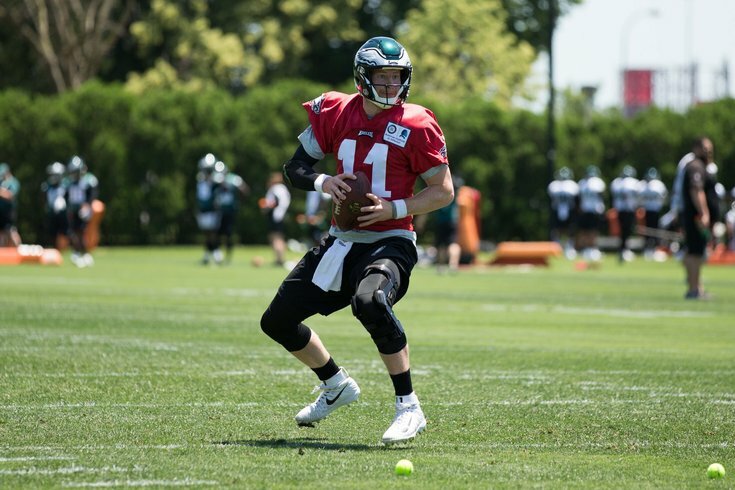 Throughout OTAs and minicamp, we saw Wentz participating in individual drills, as well as some non-contact drills, like 7-on-7's, and he very clearly looked like he was ahead of schedule. Then on the first day of "real practice" on Friday, Wentz got some work in 11-on-11's. That was new, but the team was still in shells (helmets) and shorts, as opposed to a fully padded practice. On Saturday, however, the pads went on, and Wentz still participated in a contact practice, in 11-on-11's, for the entirety of the day. Not only that, there were about a half dozen moments that were eye-opening, in terms of his recovery and progression from the ACL he tore last December in Los Angeles. Early in 11-on-11's, Wentz was "sacked" (one-hand touched) by Michael Bennett, but typically the offense will still play out the rep anyway. After being sacked, Wentz escaped from the pocket, ran to his right, and then flipped the ball to a running back when a linebacker was beginning to close off his running lane. It was the first time I've seen Wentz sprint in any kind of game-action type of drill, and nothing about it looked awkward. Later, facing pressure in the pocket, Wentz did sort of a Romo spin to the outside and sprinted to his left, out-running Chris Long, who was in pursuit. He then fired on the run. That was a "Holy crap, there's no way he's not starting Week 1" play. Soon after, Wentz was in the pocket, and he made a series of subtle moves with his feet, not unlike the drill shown above, found a passing lane, and let it rip. Again, it was impressive footwork, and nothing that we've seen from him yet this offseason in game-simulated action. And finally, there was a play in which the pocket was closing in on Wentz, and a defender even made contact with his leg, but Wentz bounced away and got the ball out. I'm sure the Eagles would prefer that kind of play not happen in practice, but it was another small test, passed. I don't know how the Eagles will handle whether or not Wentz will play in the preseason games. My guess is that he'll appear in at least one game. We'll see. But the Eagles' first regular season game is 40 days away. Again, disclaimer, barring a setback, there's no way he isn't going to start that game. • Nate Gerry got reps with the first team defense, and made good use of them. On one play, he timed out a blitz nicely, got a free run at Nick Foles, and forced a throwaway. The other two players competing for that third linebacker job, Corey Nelson and Kamu Grugier-Hill, also had some nice moments. In 9-on-7 (9 on D, 7 on O) running drills, Nelson popped Matt Jones in the hole, in what was the loudest collision of the day. During that same drill, Grugier-Hill made a nice stop four yards deep in the backfield. It should be noted here that the offense is at a major disadvantage in these drills. • In other Matt Jones news, I don't think you'll be seeing him lined up as a receiver in the slot anytime soon. In 2-on-2 passing drills, Jordan Hicks stepped in front of bad Jones route and picked off Wentz. When healthy, Hicks is among the best coverage linebackers in the NFL. • Above we noted that Michael Bennett "sacked" Wentz today. He was in the backfield all day, mostly going up against Taylor Hart. Granted, Taylor Hart isn't Anthony Munoz, but Bennett's strong showing early is a good sign that the Eagles' pass rush should be every bit as good as it was a year ago, assuming Brandon Graham is fully healthy for the start of the regular season. Derek Barnett had an impressive bull rush on Halapoulivaati Vaitai. Coming out of college, Barnett was something of a one-trick pony, in that he heavily relied on his dip and bend move around the edge. In the pros, it was pretty clear that he would need to develop some inside counter moves, as well as "converting speed to power," i.e., a bull rush. Barnett has worked hard at developing his pass rep repertoire, and he's only going to get better. Seventh round draft pick Jordan Mailata got beaten badly by fellow rookies Joe Ostman and Josh Sweat. Ostman hit him with a nice inside spin, while Sweat simply smoked him around the edge on a pure speed rush. Sixth round rookie Matt Pryor had a good showing. No one moment stood out, but he seemed to be winning all his reps. I'll also note quickly here that Pryor got some first team reps today, filling in briefly for Brandon Brooks at RG. • Greg Ward had a nice one-handed grab today in the flat, before turning it upfield. He has had a nice start to camp. • It was another rough day for punter Cameron Johnston. I didn't clock his punts for hang time like I did on Friday, but there were shankopotamuses-a-plenty today once again. As a reporter in Philadelphia, I can confirm that it is hard to get questions in during press conferences. You need timing, a loud voice, and a bit of forcefulness to be heard. Freaking Doug Pederson just walks up, and with no effort at all, wins a question face-off with perfect timing and form, and then walks off like it's nothing. The guy can't lose.